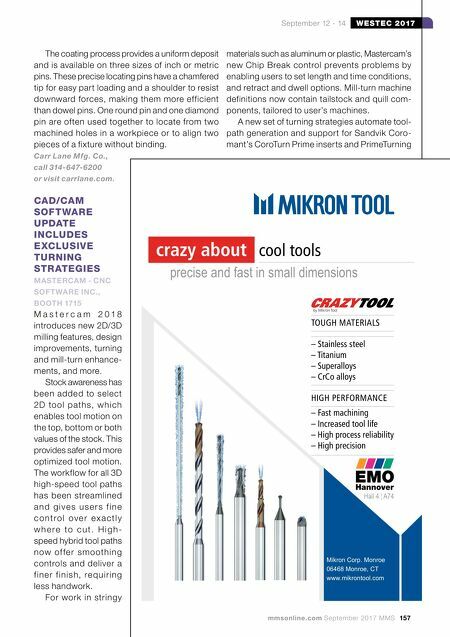 156 MMS September 2017 mmsonline.com WESTEC 2017 September 12 - 14 VISES DESIGNED FOR PRECISION CNC PRODUCTION TO TOOLROOM APPLICATIONS KURT MANUFACTURING - INDUSTRIAL PRODUCTS, BOOTH 2602 Kur t will show its lineup of vises for five-a xis, high-precision production machining, including its DX6 CrossOver vise. The DX6 has the same bed height and distance from keyway to station- ar y jaw as the company's D688 vise, making them interchangeable. Design attributes include the AngLock and pull-type features combined with a four-bolt stationar y jaw. The vise also features a full 9" jaw opening within the inside jaw position. A light, narrow 7.39" × 16.810" body enables more vises on the machine table. The 80,000-psi, ductile iron body also provides chip evacuation straight through the sides and end of the vise to prevent chip build-up. 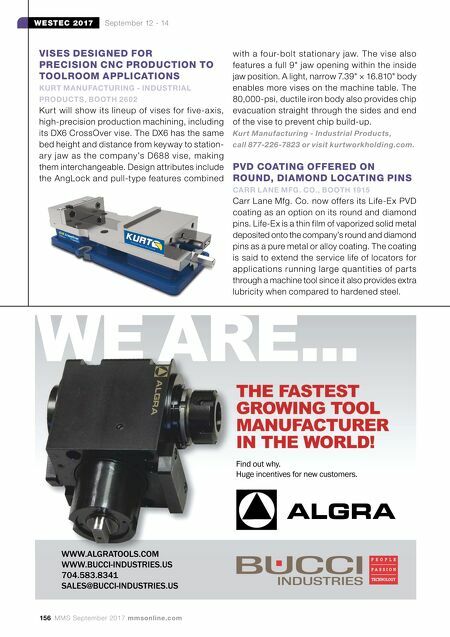 Kurt Manufacturing - Industrial Products, call 877-226-7823 or visit kurtworkholding.com. PVD COATING OFFERED ON ROUND, DIAMOND LOCATING PINS CARR LANE MFG. CO., BOOTH 1915 Carr Lane Mfg. Co. now offers its Life-Ex PVD coating as an option on its round and diamond pins. Life-Ex is a thin film of vaporized solid metal deposited onto the company's round and diamond pins as a pure metal or alloy coating. The coating is said to extend the service life of locators for applications running large quantities of par ts through a machine tool since it also provides extra lubricity when compared to hardened steel.